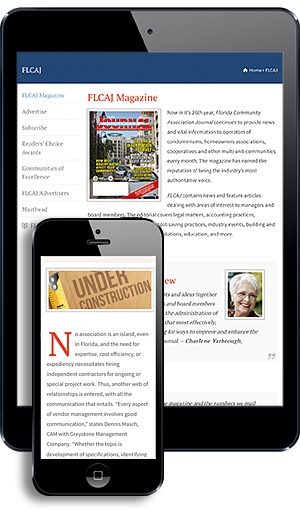 Florida Community Association Journal is excited to present the 2016–2017 Salary and Information Survey. The Survey depends on our readers, and we want to thank all who responded whether by the Web survey or the CondoJobs website. We trust this information will be helpful in evaluating salary and benefits in your community. As in previous years, the largest percentage of responses to the Salary Survey came from the Southeast region at 36 percent (Figure 1). Naturally the concentration of condominium associations in Southeast Florida also means there is a larger concentration of community association managers there. Southwest Florida has the second most responses with 26 percent and Central Florida saw an increase for a second year in a row with responses at 24 percent. This year’s survey was completed by 75 percent of condominium communities with 21 percent of HOAs and four percent of cooperatives. Of those communities, 95 percent employed a paid manager showing that communities are placing themselves primarily under professional management (Figure 2). Fifty-six percent of communities have an on-site manager and 39 percent use a management company. The average community surveyed for 2016 (Figure 3) is 30 years old, contains 341 units with the average unit priced at $385,000. The average budget in 2016 increased by more than $356,633, with the annual 2016 budget coming in at $1,820,016 compared to $1,463,383 in 2015. The manager profile (Figure 4) shows the average manager is 57 years old. In a pattern noticed in last year’s Salary Survey, the percentage of female managers increased to 60 percent in 2016 compared to 58 percent in 2015, while male managers decreased to 38 percent from 40 percent in 2015. The average number of years managers have spent in management is 17 with six years in the current job. Manager salaries are a reason for continued excitement as the average salary of $62,412 in 2016 is a modest increase of $1,568 from the average salary of $60,884 in 2015, which was an increase of $4,586 from 2014 (Figure 5). Two consecutive years of manager salary increases is a good thing, and additionally, there was a bounce back of communities providing 65 percent of their managers with health insurance in 2016 compared to only 58 percent receiving health insurance in 2015. The Southeast continues to lead the state in highest income per region followed by the Southwest, and both these regions saw increases in annual income as did the Central and Panhandle regions. Only the Northeast region saw a slight decrease in its average annual salary compared with 2015 (Figure 6). The next four charts (Figures 7–10) present income in relation to the number of units in an association, average price of units, annual budget, and length of employment. For the most part, the trend is clear that more responsibility leads to greater pay. This year’s survey indicates an increase in the average hourly wage for everyone when compared to 2015 except the community’s bookkeeper, maintenance chief and security chief. While the average employee is being paid more per hour, the average number of employees per community declined for the second year in a row from nine in 2015 to seven in 2016. To get an early start on helping FLCAJ compile next year’s 2017–2018 Salary and Information Survey, please visit www.fcapgroup.com/survey.